Which global auto giant is the better bet for new money now? Auto stocks have been under pressure recently. Concerns about slowing sales in the U.S. and other major markets, along with worries about "disruption" by new market entrants and new models of personal mobility, have investors shying away from shares of the major global automakers. That has created some opportunities. The best automakers remain solidly profitable businesses with the potential for incremental growth and dividends that can give an investor's total return a significant boost over time. Two of the largest automakers, Toyota Motor Corp. (NYSE:TM) and Volkswagen AG (NASDAQOTH:VWAGY), are among those that have seen their shares slip over the last year. Both are well-run companies with huge scale and dominant positions in important regional markets. But which is the better buy for new money now? Let's take a look. Volkswagen is gearing up to be a major player in electric vehicles. Its I.D. Buzz concept previews one of four VW-brand electrics set to arrive between now and 2023. Image source: Volkswagen AG. When we look at valuation measures based on earnings, both stocks are trading somewhat below the historical norm for auto stocks in good times (around 10 times earnings). 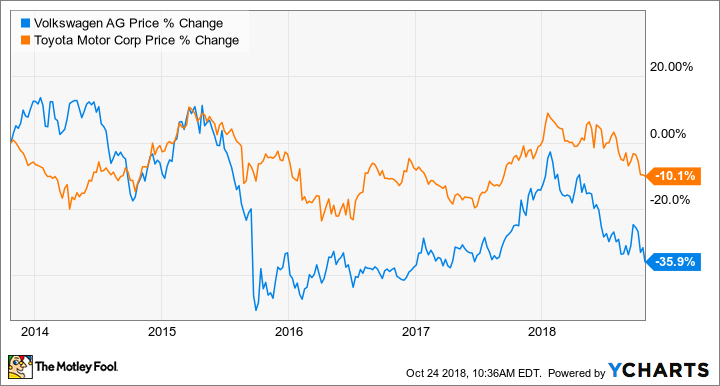 At the moment, Toyota is trading at about 8.2 times its trailing-12-months earnings, while Volkswagen is trading at a somewhat cheaper 6.5 times trailing earnings. Because analysts expect earnings at both companies to rise somewhat after the current fiscal year, both look a bit cheaper on a forward basis. 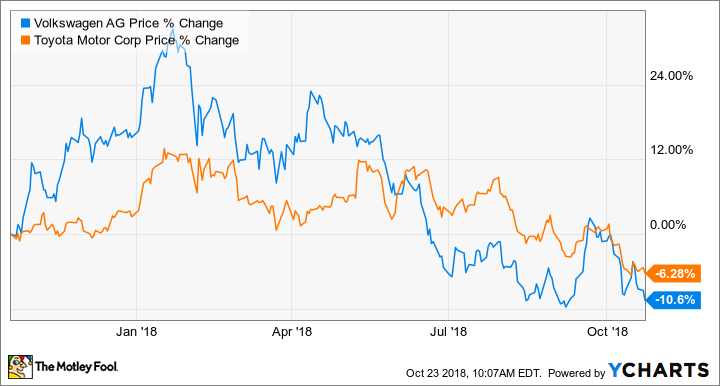 Volkswagen is trading at about 5 times its expected 2019 earnings, while Toyota is trading at about 7.9 times its expected earnings in the fiscal year that will end on March 31, 2020. Toyota pays dividends twice a year. In the fiscal year that ended on March 31, 2018, it paid a total of 220 yen per share, up from 210 yen per share in the two fiscal years prior. That dividend translates to a yield of about 3.4%. Volkswagen pays a dividend once a year, after its annual meeting in March. This year's dividend on VW's "ordinary shares," or common stock, was 3.90 euros, for a dividend yield of about 2.8%. VW has historically paid a strong dividend, but the huge costs of its diesel-emissions scandal led the company to cut its payment to just 0.11 euro in 2016. It paid 2.00 euros in 2017. VW's current business plan includes an intent to maintain a distribution ratio (the percentage of its net cash flow that is returned to shareholders) of 30%. The takeaway: Toyota pays the better dividend right now, but VW's could grow over time. Toyota sells more hybrids than any other automaker. Will that give it an advantage as the world moves toward pure electric vehicles? Image source: Toyota. Volkswagen and Toyota share an important distinction: They're both huge employers in their respective countries. That's important to understanding both the risk and the growth potential of the two companies. Those totals are big enough that both companies enjoy some level of protection from their respective governments: Neither is likely to go bust any time soon. But there's a flip side to that: It is very difficult, politically speaking, for either company to make significant job cuts in its home country. That dynamic lowers the risk of an investment in either company in some ways, but it also means that both companies have limited ability to reduce costs. That said, both Toyota and VW have ongoing cost-reduction efforts that have generated some benefits over the last few quarters -- but further cost gains are likely to be limited. VW's growth plan is heavily focused on electric vehicles and investments in "sustainable mobility." It aims to boost its operating margin to between 7% and 8% by 2025 (from 6% in 2015, excluding special items related to the diesel scandal), and to hold its distribution ratio at about 30%. Toyota's growth plan is more of an incremental one. Like several of its rivals (including VW and GM), Toyota is in the process of moving most of its vehicles to a shared architecture. That's expected to reduce costs and increase the speed with which it can launch new models and variants. Both Toyota and VW are making substantial investments in driverless-vehicle technology, electric drivetrains, and new technology-enabled models of personal mobility. Those areas could yield profit growth in time, but it's too early to try to quantify those. So which is the better buy now? As we've seen, Toyota and VW have a lot in common. Both are healthy and well managed, and both are dominant players (and employers) in their home markets. So which is the better buy today? The answer lies in this five-year chart. VW's stock was hammered in 2015 after the world learned that it had shipped millions of diesel-powered vehicles with software that cheated emissions testing. That scandal has so far cost the company about $32 billion, including a charge of 1.6 billion euros (about $1.8 billion) as recently as last quarter. VW's stock is still trading well below its prescandal levels, in part because it's not clear how many more shoes are left to drop. But what does seem clear is that VW is closer to the end of this scandal than to the beginning -- and that its longer-term prospects seem bright. The upshot: Toyota's stock probably doesn't have a lot of downside beyond the cyclicality of the auto industry generally. But it may not have a ton of upside beyond that cyclicality, either. VW, on the other hand, is still recovering from the diesel scandal -- and that opens the possibility that it will deliver a better reward to patient investors over the next five to seven years or so.